MetroKitchen has several 10 piece knife sets at different price points so you can find the set that best fits your cooking needs and budget. 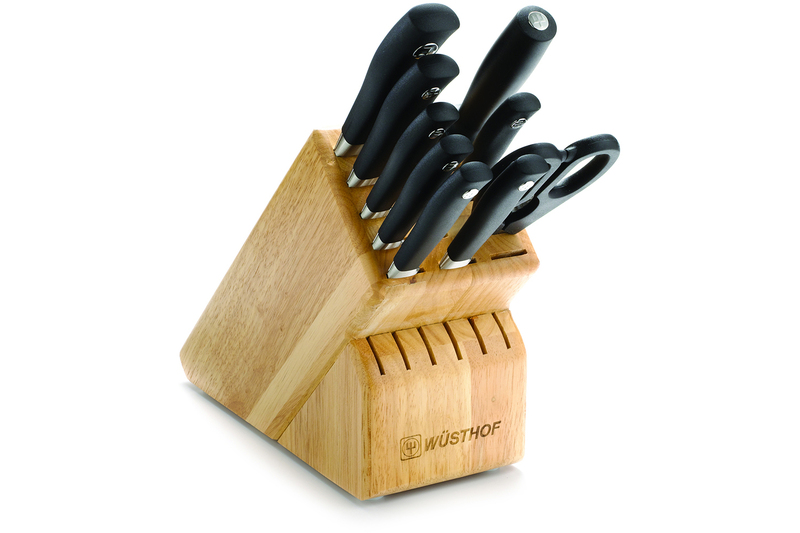 The Wusthof Grand Prix II 10 piece knife block set has 2 paring knives as well as a trimming knife. This Wusthof Classic set is a great choice if you do more fine work vs. slicing and chopping. The Classic blade is forged from a single piece of German-made stainless steel for strength and to ensure that it keeps its original sharp edge as long as possible. Look for a lifetime warranty from Wusthof too! Always use a wooden cutting board to preserve blade sharpness, as cutting on hard surfaces such as stone, metal or glass quickly dulls blades. It's best to store your Wusthof knife so the edge and your fingers are protected, preferably in a block or in-drawer knife tray.